Summer is now underway in the northern hemisphere with long warm sunny days and bright colourful tones everywhere. To inspire you take a look at a selection of Royal Crown Derby’s colourful tableware and giftware with colours enthused by the brightest of seasons. Summertime is here and with it brings the botanicals to life with colourful blooms and tonal splashes of colour into the natural world making summer a truly colourful time of year. Royal Crown Derby have a wonderful selection of summer flora and fauna inspired tableware and giftware perfect to celebrate the season. 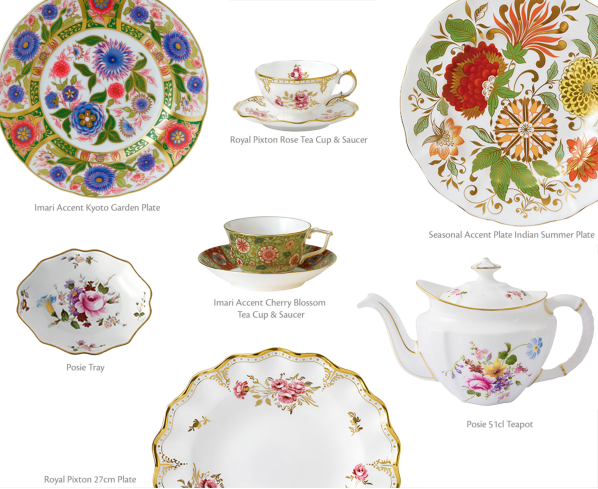 From the delicate hints of roses in the Royal Pinxton Rose tableware to bright pops of orange and red in the Indian Summer Accent plate, there is a wide array of floral inspired designs to bring summer colour into your home perfect for summer dining. 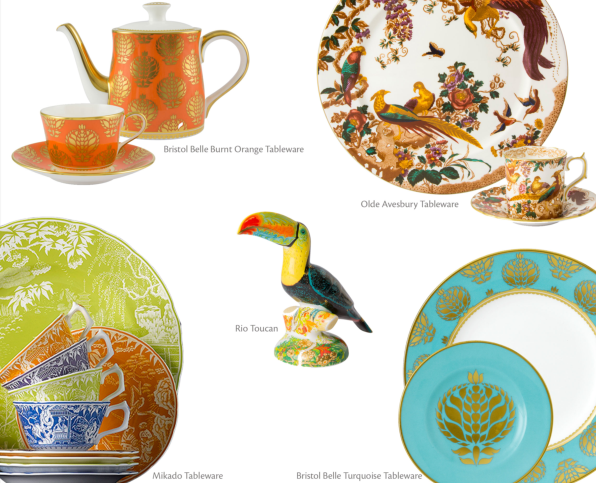 Tropical, vibrant and eye-popping colours provides inspiration with contemporary tableware and giftware patterns. From botanical leaves and bright neon colours, bringing the tropics from across the seas onto our tablescapes. From the Rio Toucan with bright bursts of 16 tropical colours to the pops of acid colour in the Mikado Tableware range, perfect to mix and match. Royal Crown Derby have a striking range of designs to bring that little touch of the tropics into your summer home. What better way to spend the summer than to be beside the sea. Summer style brings an array of nautical style into the home. 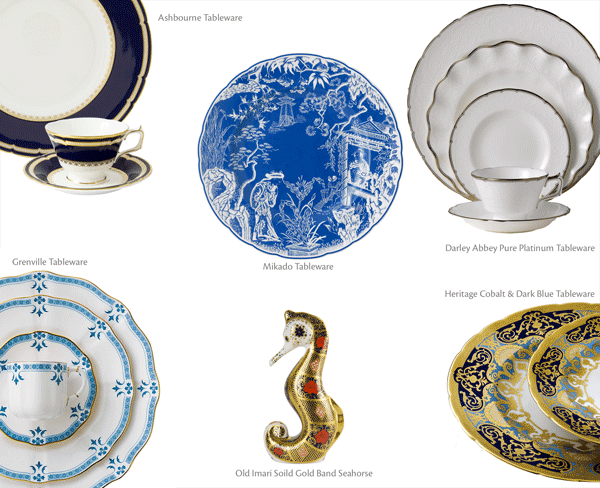 Royal Crown Derby offer a wonderful selection of tableware and giftware perfect to bring coastal luxury to your home both indoors and outdoors. From the stylish textured white on white pattern of the Darley Abbey Pure tableware design perfect to bring a subtle nautical style into your home or the more elegant and luxurious Heritage tableware range in Cobalt & Dark Blue or Forest Green & Turquoise with a stunning opulent touch of 22 carat gold bringing maritime regalia to life. Take a look at Royal Crown Derby’s full range of tableware and giftware to bring some summer colour into your home here.